According to oriental philosophy there are five elements: water, wood, fire, earth and metal which are based on seasons and have corresponding colours, shapes, directions and materials. The aim of feng shui is to have a balanced combination of all the elements in any workspace depending on the needs of people working there. In feng shui, different space can represent different aspects of business such as clients, partnerships, collaboration, innovation, projects, legacy, team work, wealth and profits, expertise, success and reputation and so on. Depending on the needs of the company these areas can be energised to boost the corresponding aspects. Research suggests that people have a preference for curvilinearity vs. angularity. Adding round or oval shapes will naturally balance angular environments. Sharp corner and patterns should be minimised. How workstations are positioned in space can affect the performance of workforce. Sitting in ‘a power / commanding position’ where one has a support of a wall and clear view of doors is preferred. Sitting with one’s back to the door can instill feelings of insecurity and anxiety. Feng shui works through energies, symbols, metaphors, affects, sensations, narratives, anchors, images and expectations. Semiotics is study of meaning-making and is a very useful tool to help not only to elicit people’s perceptions of any workplace but also to manage those perceptions. A sense of belonging is one of the most important aspects of making offices work. People thrive in places where a sense of community and collaboration is present implicitly and explicitly. Biophilia effect suggests that people do well and thrive in natural environments. Including as many natural or naturally-looking elements such as plants, etc and themes (photo wallpapers with nature) will enhance the biophilia effect in the new office. 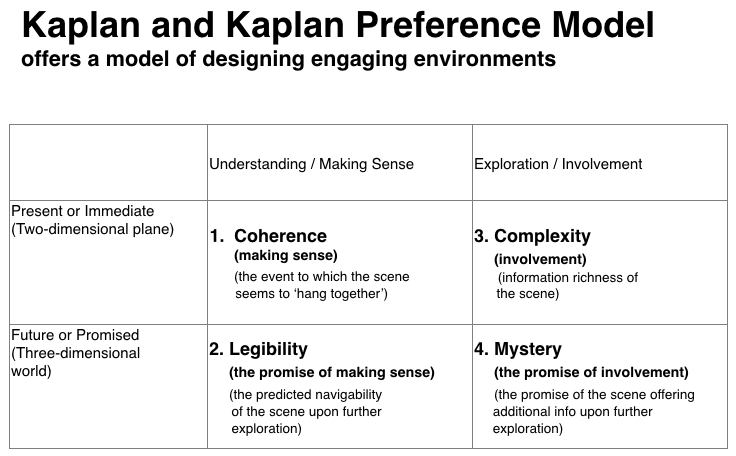 Kaplan and Kaplan’s preference model (1989) describes four basic preference factors for any space i.e. coherence, legibility, complexity and mystery. Recursive and imbedded decorative design elements can enhance fractality of the place. Our bodies have fractal patterns so we feel better in fractal environments ie nature. Biophila or natural elements are good examples of utilisation of fractality. A fractal is a mathematical set that usually displays self-similar patterns (Benoît Mandelbrot, 1975). The concept of fractal extends beyond self-similarity and can include detailed patterns repeating themselves and is a good measure of complexity of any environment. Wabi Sabi is a Japanese concept of seeing beauty in imperfection and good reminder that physical things age and if they’re allowed to age gracefully, they can make the place look more inviting, welcoming and relaxing and add an important longevity and legacy aspect to the feel of the space. Embrace imperfections of any workspace by reframing them as wabi sabi. Good design is good feng shui and vice versa. Posted in Feng shui books reviews.